Common Core Learning Standards: Drawing Battle Lines in K-12 Public Education is a concise, accurate, and up-to-date resource for those interested in understanding one of the most volatile public education debates in United States history. 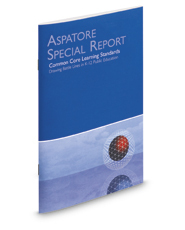 Written by experienced education law attorneys, this special report describes the issues that have arisen out of the implementation of rigorous new standards that seek to elevate K-12 academic achievement across the country. At the center of the conflict is a concerted nationwide call to raise student performance countered by the concern that this reform agenda limits local control of academic standards and decision making. The different niches represented and the breadth of perspectives presented enable readers to get inside some of the great legal minds of today, as these lawyers offer up their thoughts on the keys to success within this dynamic legal field.